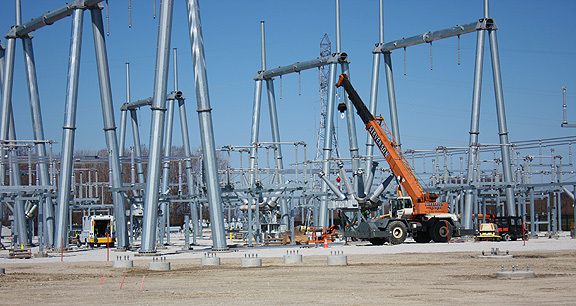 Project obstacles and solutions: As part of a major overhaul of the electrical grid in northern Indiana, a new electrical substation was designed and built in Reynolds, Indiana. The substation was the hub of two separate high tension T-line projects: the Greentown-Reynolds 765kV Multi-Value Project that runs 70 miles of new transmission lines; and the Reynolds-Burr Oak-Hiple 345kV Multi-Value Project that runs 100 miles of new transmission lines. These are two of the projects required by the Midcontinent Independent System Operator (MISO) that oversees the transmission of electricity in 12 U.S. states and one Canadian province. IMI supplied concrete for the all the foundations for the electrical structures. This included pads for some of the larger structures and caissons for the high tension poles. The caissons were drilled 50 feet deep. The concrete was poured via a tremie line as the drill was backed out of the ground. This required a continuous pour during the drilling of the caissons. A high slump was required to keep the concrete pumping during this operation. IMI QC/QA designed a mix that used a superplasticizer to reduce the water-to-cement ratio and keep the concrete flowing during the pour. Concrete was mixed to achieve 5,000 psi per specifications. IMI supplied 4,000 yards of concrete for the foundations. The Greentown-Reynolds project is expected to be completed and on grid in 2018. The Reynolds-Burr Oak-Hiple project is expected to come online in 2019. For more information about high strength, continuous flow concrete, contact the sales representative for the concrete plant nearest your location. Click here.